This wall mirror has a rich finish and an exquisite border. Give your favorite room a new look with this wonderful wall mirror design. The piece has a hand-forged metal oval frame in an oil-rubbed bronze finish that looks wonderful in a bath, dressing area, or dining room. 22" wide x 32" high x 1 3/4" deep. Hang weight is 18 lbs. Glass only section is 20 3/4" wide x 30 3/4" high. Surrounding frame is 1" wide. A traditional wall mirror from Uttermost. Oil-rubbed bronze finish. Beaded frame detailing. Mirror has beveled glass edges. I am vey excited about the deal of this mirror....subtle but unique. Love the style and bronze finish. 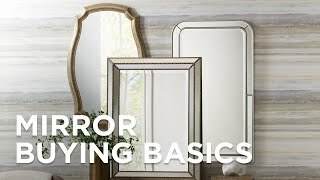 Doo you repair lighted mirrors? BEST ANSWER: Unfortunately we do not offer repair services. One reviewer hung this mirror sideways with difficulty. Are the hangers designed for this? I need to hang it horizontally. BEST ANSWER: Hi, the mirror can be installed in a vertical or horizontal position. BEST ANSWER: The mirror itself is approximately 1/4"-3/8" in thickness. Purchased for my guest bath, this mirror instantly transformed a previously "ugly duckling" bathroom into a lovely, welcoming space. The oval shaped softened a small, square room, and the beaded edge in the oil-rubbed bronze finish is neither overwhelmingly masculine or feminine, so it's perfect for a guest bath. The top-notch quality mirror is so attractive, yet surprisingly sturdy. It's an impressive piece I will enjoy for many years. This mirror is absolutely beautiful. I have it in my powder room and have had many compliments from my guests. I would highly recommend this mirror for it's beauty and quality. I order 2 mirrors for my bathroom. They are beautifully made mirrors. They fit perfectly with my oil bronzed fixtures. Did a bathroom remodel using rubbed brass fistures (looks almost black.) This mirror looks great! I have two of these mirrors in a bathroom with a double sink vanity. Nice looking substantial mirrors. Made in china and very expensive but they do look good. Only had them up a week so I can not speak to longevity. The brackets to hang horizontally are welded lopsided. We sent the first one back for a refund, and reordered. The second one was better, but still not right. We had to put one wall screw higher than the other and off center. Very difficult.